After we left San Marino we drove to Rimini. That was a short drive because Rimini is only 24km away from San Marino. I knew that Rimini is a popular Italian seaside town full of beach bars. However, we didn’t go to Rimini to spend some time at its long sandy beach but to see its castle and other interesting landmarks. We found free parking in Rimini because I discovered a useful parking website which I bookmarked for future use but somehow I lost all my bookmarks the other day so I can’t share that website with you. From the free car park we walked for less than 15 minutes to the Malatesta Castle (Castel Sismondo). On our way to the castle we went through the Roman arch, Porta Montanara. That was our first glimpse of Roman Rimini. We were also close to the ruins of the Roman Amphitheater during our walk around Rimini but we decided to skip it because we’d seen roman amphitheaters in better conditions elsewhere. The Sismondo Castle was built in 15th century by Sigismondo Pandolfo, the most famous lord of Rimini. Unfortunately, like the castle in Imola this one was also closed (because it was Monday) so we only took some photos and headed towards the city center. There’s a big building site next to the castle and from what we read it’s the site of the new museum dedicated to Federico Fellini, probably the most famous Italian film director of all times. I’ve decided to visit Imola on our road trip to San Marino. It’s right on the way to San Marino so it’s a convenient stop but it wasn’t exactly half way on our route so stops at the service stations along the motorway were needed too. Unfortunately we also had a few problems on our way to Imola. Firstly, our baby’s music broke down and then we had a flat tyre just past Padua. My husband quickly changed it but he said that we’d need to fix it because apparently you can’t drive fast or too far with a spare tyre which meant that a visit to a garage in Imola was a must. Therefore, it took us much longer to reach San Marino in the end. However, our car problems didn’t deter us from our sightseeing plan of Imola and we firstly walked around and saw what I’d planned and then we sorted out the car. Imola is a town in Emilia-Romagna region of Italy not far from Bologna which is considered to be the gastronomical center of Italy. Imola was famous for hosting the Formula One San Marino Grand Prix at its racecourse Autodromo Enzo e Dino Ferrari. The F1 race of San Marino isn’t held anymore and nowadays Imola’s racecourse is used for car and motorbike races. It’s here that the famous F1 driver Ayrton Senna met his tragic end in 1994. Of course, we just had to visit the racecourse but our first stop was Imola’s Castle. 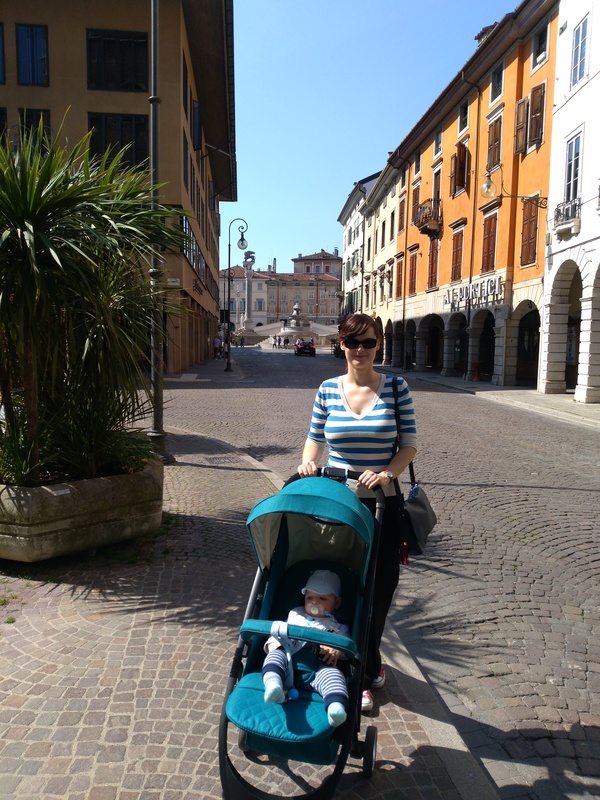 For our first day trip abroad as a family I chose a town in Italy which I haven’t visited before. As it turned out my frivolous method of choosing Udine for a day trip was an excellent choice because we spent a wonderful Sunday in a surprisingly pretty town. Udine is the second largest city in Friuli-Venezia-Giulia region in the northeastern Italy between the Adriatic Sea and the Alps. The capital of this autonomous region is Trieste, a city I know quite well. 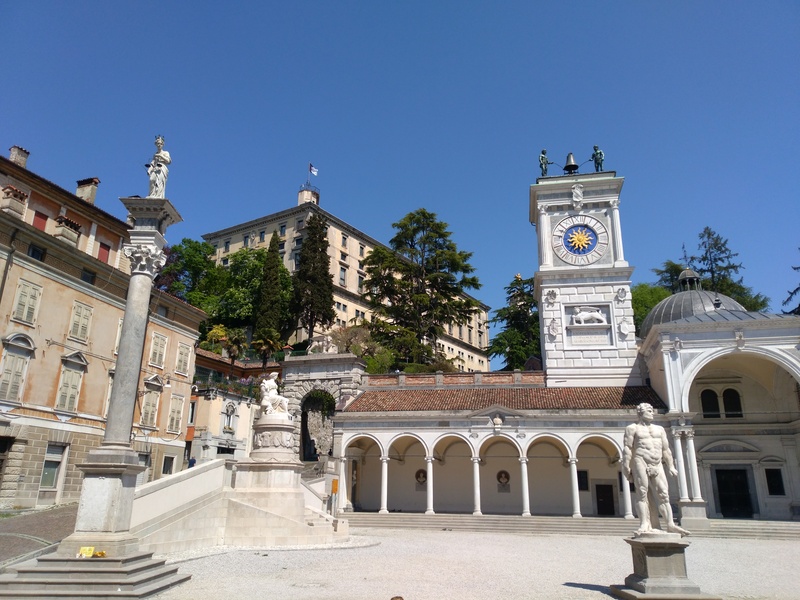 I googled the major sights of Udine and made a loose plan of what to do/see on our day trip. However, I didn’t think much about the actual drive to Udine (only two and a half hours from our home) or the parking in the city. So, when we saw the exit for Udine my husband smartly decided to pull over and actually check on GPS which exit we have to take to get in the city center. All I wanted was to park somewhere near the train station because I thought that the train station (or McDonald’s) would be a good option for having baby changing facilities. No, the train station doesn’t have it (it has free toilets, usually you have to pay for them in Italy) but McDonald’s which is just across the train station has a toilet with the baby changing pad so we sorted baby V. out before we commenced our sightseeing of Udine. The plan was actually to use the service station along the motorway before we entered Udine but since there was none my idea of parking near the train station was a good one. Parking was free and it seems that parking in Italy on a Sunday is always free (at least in this part of Italy). It was a rather warm and sunny Sunday in a city seemingly devoid of residents. But that’s Italy on a Sunday 🙂 Yes, there were a lot of people around the train station but on our short walk from the train station to the main square (15mins on foot ) we didn’t come across many locals. Nevertheless, we weren’t the only tourists in the town and we later saw where the locals hid: at the street food trucks’ festival in the park below the castle. Before we reached the main square we walked under the pretty porticoes and my heart skipped a beat with joy. I first encountered porticoes in Bologna and I just love this rather clever architecture which provides you with cover from the sun and the rain when you walk around the town. We glimpsed the cathedral just before the main square and decided to see it on our walk back to the car. But I didn’t remember the name of the church and when I tried to find it on Google for the purpose of this post I couldn’t. There wasn’t such church on the map and when I googled Anglican church in Florence the search engine gave me a different result. After quite a bit of the research I found my mystery church. It is the Holy Trinity church which was acquired by the Waldesians in 1967. It was the first Anglican church in Florence built in the first half of the nineteenth century by Domenico Giraldi. Only fifty years later the English expat community of Florence decided to rebuilt the church in an English perpendicular style to designs by George Frederick Bodley. There are statues of St John the Baptist, King David, St Alban, St Augustine, St Stephen, St George, St Andrew and St Patrick on the grey church tower. The main English church today is St Mark’s English Church. After admiring the marble statues of the saints on the church tower I crossed the street and saw a park and thought that I might sit there for a while and enjoy the sunshine. 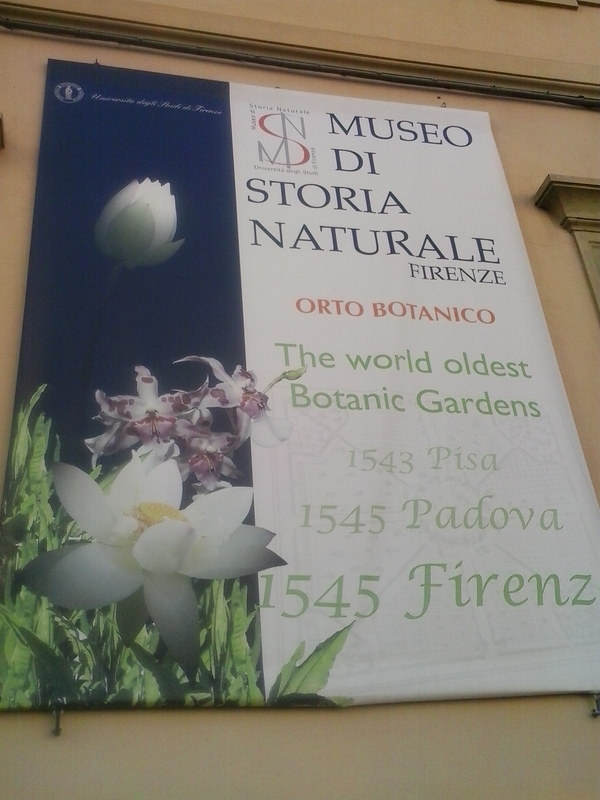 But this park wasn’t actually an ordinary park; it was the Botanical garden of Florence and so I decided to visit it. The entry cost me only 3 euros. I walked around the botanical garden, sat and soaked up the sun and then explored some more. In the end I decided to take some photos with my phone and maybe write a few words about it for my travel blog :).